In association with BRT, Imerys Minerals has become an enthusiastic partner in the restoration of two 5ha grazed paddocks in the buffer zone around their Lal Lal kaolin mine. These paddocks are located north and south of a significant artificial wetland, which was the site of a kaolin open-cut mine. The whole area including the wetland occupies about 15ha and is referred to as the ImLal biorich demonstration project. Planting design was undertaken by Stephen Murphy, with input on forestry species from Phil Kinghorn. The revegetation sites north and south of the wetland are both relatively flat with some low areas that tend to become flooded in average rainfall years. The soils at ImLal have developed from both basalt lava flows and granite intrusions, resulting in variable clayey and sandy soils on the planting sites. The southern site (depicted below) is about 400m long, narrow at the eastern end and widening to 200m at the western end. It has three distinct soil and drainage characteristics.The narrow eastern end and the southern part of the wider western end consist of a heavy basalt clay loam that drains to a slightly lower area in the centre. This wet central area can be covered with a shallow sheet of water for most of the winter and is a heavy clay soil. The third soil and drainage variation is along the southern boundary where granite sand has blown in from the north and built up to form a shallow sandy bank, popular with local rabbits. This soil is a well-drained sandy loam. Bordering the sandy bank is a roadside reserve, which is rich in diverse indigenous vegetation ranging from mature manna and peppermint gums, through to an understorey of black wattle and cherry ballart, and a shrub layer of prickly and silky tea-tree, down to a ground layer of parrot peas, orchids and lilies. On the western boundary the poorer drainage is reflected by the emergence of swamp gums as the dominant canopy species. The southern ImLal site was planted in October 2010. The northern site is shaped like a lopsided square with sides about 250m long. The soils on this site are more uniformly a sandy clay loam, showing the combined influence of the black clay from the basalt and the sharp sand from the granite. In spring 2011 this site is revealing its tendency to be wet in large patches on the south-west corner. The dominant remnant vegetation is swamp gum. Swamp gum is also found on the southern, western and eastern boundaries as well as in a large patch within the site to the north. There are no understorey or shrub layers remaining under the swamp gums because of a long history of grazing. The southern site was ripped in early winter 2010 when it was still fairly dry in a spiral pattern and then sprayed with glyphosate and simozine. Ripping was necessary because the soil was hard and compacted. The northern site was slashed a fortnight prior to spraying with glyphosate and simozine. Ripping was not necessary because the soil structure was good showing less compaction than the southern site. Both the southern and northern sites are dominated by bent grass, Agrostis sp., which has responded well to the herbicides resulting in 12 months weed control on the southern site. The rabbit population was controlled before planting by spotlighting and fumigating warrens. All plants were treated with Sen-Tree rabbit & hare repellent before planting. Tubestock planting of the south site. 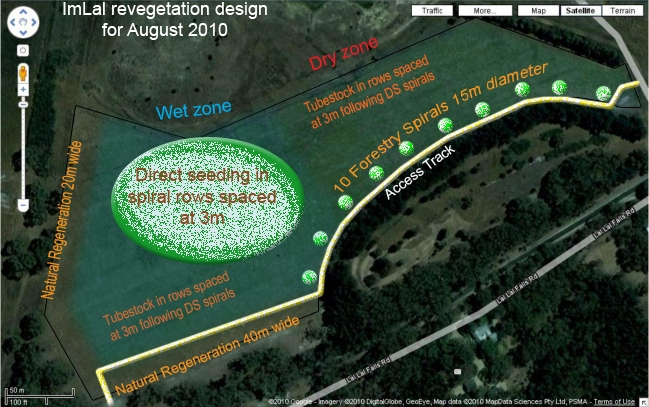 • Direct seeding (delayed in 2010 because planting site was too wet. Now planned for spring 2011). The design of the two sites sets out to recreate indigenous shrubby woodlands similar to the remnant vegetation found locally. Commercial forestry tree species were also incorporated. This combination achieves the primary objective of the project, which is to restore the site with productive, biodiverse sustainable plantings. indigenous plants for the plantings. (4) Clustering plants into same species groups of 5s, 10s & 20s. (8) Incorporating 10-12 forestry species in accessible large clumps to provide resources and a future income stream. Two ideas made the community planting day simple – a two stage planting and colour coded marker stakes. On day one, the canopy & forestry trees were planted. On day two, the shrubs and the understorey were planted. On both planting days each tree and shrub was marked with a colour coded bamboo stake to indicate its size (pictured). Red stakes were for canopy trees; green for understorey trees; white stakes were for small & medium shrubs. Day one: planting the skeleton – the indigenous canopy and forestry species were planted first to create a scattered pattern of tall trees. The canopy trees provide the framework around which the other smaller shrub and understorey plants are grouped. The goal is to have the canopy scattered evenly around the planting site. We planted them in groups of 5 trees of the same species (e.g. 5 x swamp gums spaced at 3m). These groups were planted 25m apart to mimic old woodland trees growing naturally at a spacing of 16 trees/ha. The forestry trees were planted in same species groups of 40 at a spacing varying from 3m to 5m. The forestry trees are grouped along the access tracks in the southern and northern sites to allow for convenient management and harvesting. Day two: putting flesh on the bones – the understorey and shrub species were planted in random (same species) groups of 10 to 20 in the remaining unplanted areas. Volunteers were asked to simply vary their colours. If they were planting shrubs (white stakes), they planted next to plants with either green (understorey) or red stakes (canopy). By always varying the colours and planting in groups, the vegetation automatically combined to create structural layers.